O Noble Readers of This Blog, I beseech thee, please extend your forgiveness to your most humble servant for my exgregious overuse of my laptop’s Copy-Paste function. Truly, I give far too easily into temptation, especially with a final performance due in Acting tomorrow and with Sarah LaRose Holland’s eloquent, editing-unnecessary responses to my e-mail interview sitting right within reach. Lo! I am weak, and offer less resistance than a fat kid doth to cake, or so 50 Cent would have us believe. Anyhow, there shall be in the future another Kinetic Kitchen, and I swear on the soul of Gene Roddenberry, I will endeavor to actually write an article that time. 1. What is it that you love most about the artistic work you do, and why? As the presenter of the Kinetic Kitchen, I enjoy providing opportunity for choreographers to showcase their work. The series brings together artists that may or may not know each other and provides a vehicle for performing their work. It’s a great way for an artist to focus on the creation of their dances, and I take care of the nuts and bolts of helping them get their art onto the stage. This is very satisfying, helping choreographers get their work out in front of audiences. 2. How is performing at Patrick’s Cabaret different from doing so at other venues? The Cabaret has a unique ambience and performance space. It’s very cozy and intimate. It’s not your typical black box performance space. The Cabaret has been a very good fit for the dance series. Interest in and support for the Kinetic Kitchen dance series has grown tremendously since relocating the dance series to Patrick’s Cabaret. The Cabaret also does a lot to help make presenting dance easier for me by allowing me to showcase the Kinetic Kitchen as a Guest Curator. The Cabaret allows me as a presenter to focus on presenting, similar to how the Kinetic Kitchen allows choreographers to focus on being choreographers. It’s a very good fit all around. Patrick Scully has also helped on a personal level to advise me as a presenter and has supported my dance series both personally and professionally. That personal connection with Patrick is also a very big reason why I so enjoy having the Kinetic Kitchen at Patrick’s Cabaret. 3. What would you say are the major influences on your work? As a dance presenter, I’d say the big influences have been other venues that have allowed me opportunity to discover that I could start to showcase other people’s work. Christopher Watson has given me many opportunities over the years to help facilitate dance performances with multiple choreographers on the bill. He gave me the chance to organize some “2 Flights Up!” performances at his old dance school in the Calhoun Building in Uptown Minneapolis. Christopher also allowed me the chance to organize some of the outdoor “Dances at the Lakes Festival” held each summer in the Lake Harriet Rose Garden in Minneapolis. During my 7 year position as Artistic Director of Riverbend Dance Arts in Hastings, I also learned a lot about obtaining funding for performances and facilitating those events with the dance school and guest artists. Then I’ve also had the opportunity to realize the benefits of performing in shared performances through my professional career as a dancer and choreographer. When I first came up with the idea to start the Kinetic Kitchen, I contacted Laurie Van Wieren to find out if we could talk about her experiences as a Dance Presenter. She was very generous with sharing her ideas and experiences as Curator of “9 x 22: A Dance Lab”. Over the past few years, I’ve gotten the chance to collaborate and grow with the Dancers-Presenters Circle (DPC). Our most visible collaborations have been working together to compile a week of dance each year in celebration of National Dance Week in the twin cities. 4.What is one thing about yourself, your work, your philosophy, whatever, that you think should definitely make it into the blog post? 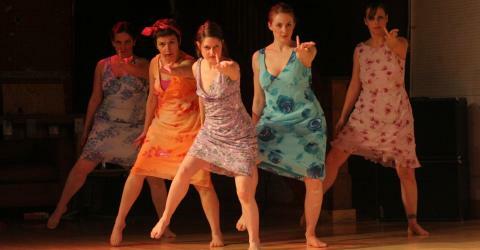 The Kinetic Kitchen is a dance series based in Minneapolis that showcases many styles of dance and movement. The series is based at Patrick’s Cabaret and performances are held about 3 times per year. There are usually 4 choreographers showcased in each Kinetic Kitchen. I also present a dance series for youth called the Kinetic Playground. This series takes place annually at the Perpich Center for Arts Education in Golden Valley. Annual Playgrounds are held in January. For more information about either of these series, please visit http://www.mnartists.org/sarah_larose or contact Sarah LaRose-Holland at sarahlarose@hotmail.com Both the Kinetic Kitchen and Kinetic Playground were founded by Sarah in 2004. Kinetic Kitchen and Kinetic Playground events have been hosted at Patrick’s Cabaret, the Mounds Theatre, Varsity Theater, Old Arizona and the Perpich Center for Arts Education.